It wouldn’t be fair to say there’s no violence in Israel. The 64 years since Israeli independence have been marked by conflict. What else would you expect of a country that’s surrounded on all sides by enemies? It’s like putting Batman in a boxing ring with the Joker, the Penguin and Cat Woman and not expecting any punches to fly. It’s true that border areas around Gaza and the West Bank are susceptible to terrorist attack given the enmity between Israelis and Palestinians. And that’s why you won’t find me sipping a cappuccino at the Gaza City Café wearing a Star of David necklace. But I didn’t miss the opportunity to visit Israel. In a country where homeland security is cutting edge and public safety is a top priority, I saw it as a worthwhile risk for a lifelong benefit. Everyday we sweep chance under the carpet. The chance we might get T-boned at an intersection, the chance we may black out from noxious glue fumes while scrapbooking, or the chance we might be electrocuted reading kindle in the bathtub. And that’s just in our own neighborhood. What about other travel destinations? With a crime rate of 845 per 100,000, Orlando is ranked one of the most dangerous cities in the U. S., but that doesn’t stop us from visiting Disney World. So therein lies the question: Why did the camel cross the road? Like this post? Follow my blog and get loads more free of charge! Just click “follow” at the top of the page. ← If It’s Asparagus, Why Does My Pee Smell Like Cabbage? I read your post through my friend Debbie, who writes the Letters from New Jersey Blog. I have traveled to Israel four times in my life and if I could afford it would pack my bags and get on the next Israel-bound plane right now. I blogged extensively about our last trip and i still have so much to tell about it, and yes, the top questions/comments of friends were: how was the weather” and “did you feel safe?” To the second question, I always answered, “absolutely yes.” I hope you share more of your trip and come check out my blog posts about our experience in Israel, we can compare notes! I am also eager to return! It’s a small country but offers huge adventure! Thanks for sharing your positive experience. Good point–the media is absolutely culprit! Very good points. I agree completely. The only time that I ever felt in danger while traveling to (and from) Israel is dealing with all the travelers pushing their way in front of me to get their luggage before me. Or pushing their way to get fresh rogelach at Shuq Machaneh Yehudah on Shabbat! But that’s so worth it it doesn’t count! What an amazing trip that must have been. As you point out, if we let fear rule us in our travels, we’d have few places left to go. It was truly amazing, and I am glad I let logic, not fear, dictate my plans or I would have lost out on an incredible opportunity with my family. another interesting perception of “safe”: In Israel, teens roam free on the streets socializing at all hours of the night, without a worry by their parents. I still can’t comprehend this, but when we were in Tel Aviv, my high school daughter met up with some of her Israeli friends at our hotel. We gave her some shekels, they took her out and they went walking buying falafel and ice cream and hanging out on the beach until after 11. I would In contrast, I would never let my daughter at the age of 15 roam the streets of NYC or any big American city without an adult. Yes, it seems more similar to Europe that way, in that kids are more mature and are allowed more freedom. I took my three kids to Israel back in 1999. Everyone said, “Oh it must have been such a great spiritual experience, because you are Jewish.” I said not, that it was a great historical experience. Israel was, for thousands of years, a crossroads of cultures. I was overwhelmed by the idea of civilizations all converging on the same small spot on the planet. And I am saddened that this tiny piece of land has been the setting for such human misery and conflict. But it’s also a shame that anyone would be deterred from going. We saw nothing of the conflict and I have never spoken with an traveller who has. Yes, it is a profoundly enlightening experience. Are you on one of those camels? I agree with everything else everyone has said above, but no one has mentioned the obvious…are you riding a camel? Inquiring minds need to know. Of course not, silly. The camel is riding me. I love this post! What a great perspective! My biggest regrets are the things I didn’t do simply out of fear. Thanks! Thanks, Cindy. Fear sometimes stops me in my tracks too. But I try to remind myself that my biggest regrets are often things I didn’t do, not things I did do. Judy, that is particularly scary when things hit us so close to home. But I”m glad you persevered and had a great trip. I hope you have an opportunity to “Walk the Bible” some day. 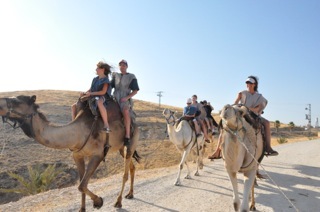 On a camel. I don’t know, there…when I visited New York, no one asked if I saw the Statue of Liberty, but I had multiple people ask if I got mugged, how rude were the locals, and if I got bed bugs… I didn’t have exciting answers to any of those, so I elaborated on hearing the rats climb on the inside of my hotel wall as to not disappoint. Did you get mugged by any rats? Not in NY, but I did when I was in Tokyo! On our trip to Israel we often heard that in the US we feel safe with our bordering countries but unsafe in our streets, while in Israel they feel safe on their streets and unsafe with their borders. Assumptions! Assumptions! All based on our knowledge sitting on the other side of the world. I am glad you didn’t fall prey to those assumptions and decided to go have fun. Thanks, Prachi. It was great to get my own perspective first hand. What a great story! And, what a powerful trip it must have been. The Israeli ministry of tourism needs your post. Yes, powerful is the perfect word! Gurrrllll! You ain’t chicken. Awesome.